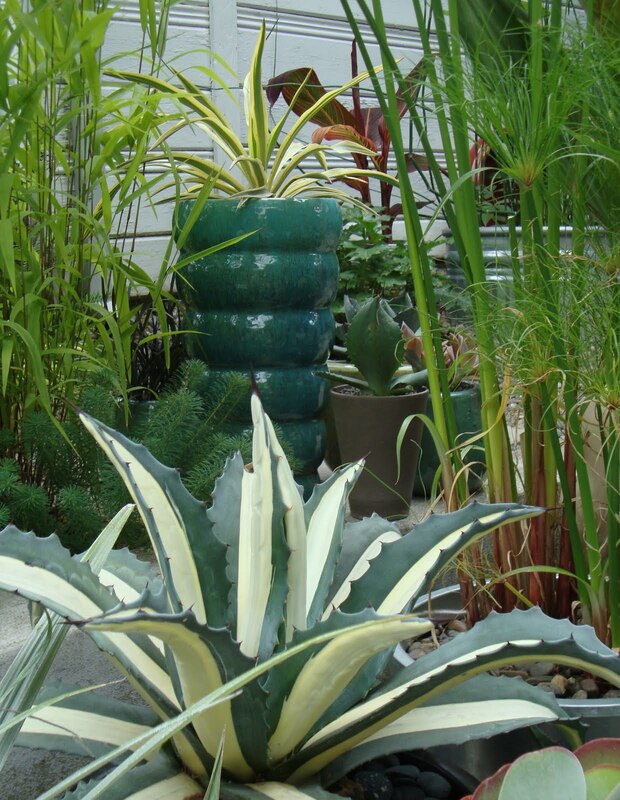 Seems lately I’ve been lusting after every turquoise pot I see…at nurseries, in books, in friend’s gardens. Well…I’m lusting no more. Instead I’m simply loving my new favorite little spot in the garden. So now you're passing that turquoise pot lust along, right? I'll take the ringed pot, please. That is a fine, unblemished medio-picta too. Maybe putting them to sleep for winter is their beauty sleep. Thats my favorite vignette too! Ceramic pots are just not affordable enough for me, but maybe someday. 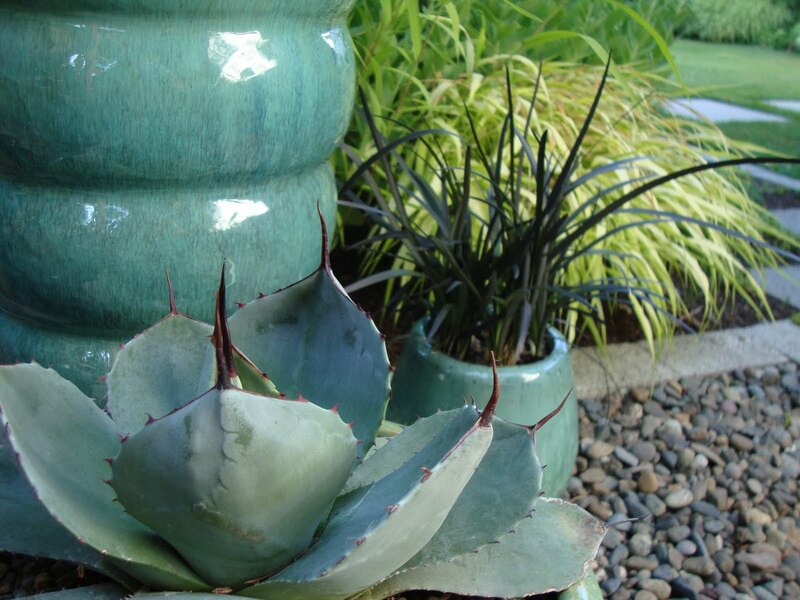 I love how the agave mirrors the color of the pot! Great composition. Wow, those are neat-o! I like those vignettes as well. You have quite an artist's touch. 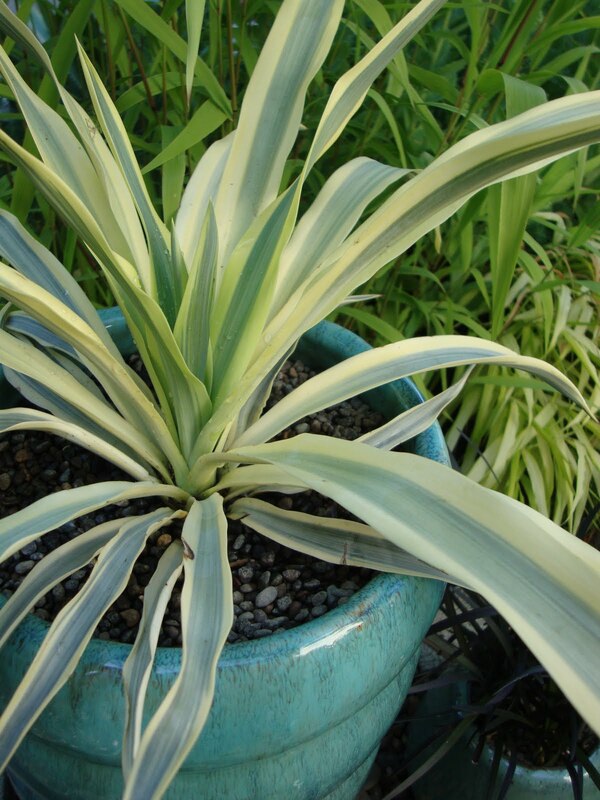 Your Agave medio-picta is fantastic. Mine hates humidity and just sits around waiting for the low humidity of a Texas October. They do fine in Austin...just 150 miles west. Weird. Ooooh, I love the funky tall container! I really want to see your garden in person. Muy muy bueno ! I want a turquoise pot in the worst way , and may even consider buying cheaper wine for a month to finance it. One must make sacrifices. Love that bumpy one especially, but all look great the way you planted and arranged them. Turquoise is the new orange? 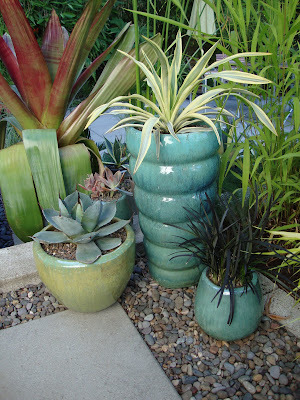 Very cool pots! Love the pairings, placement and arrangement. Denise, oh I'm sure you can find a fine selection of turq pots in your neck of the woods! Yes I am very happy the medio-picta is looking good. It had some evil infection towards the end of it's winters nap. A few sunny hot days (cause that's all we've had...just a few) seem to have cured it (hopefully). PGG, yes! Another agave lover in the making! RFG, I splurged on the tall one (bday $ from the in-laws) but to 2 short ones were on a 1/2 sale. 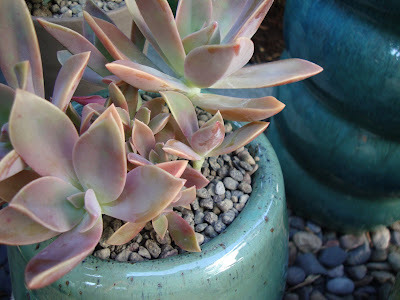 Sometimes you can pick up ceramic pots cheap....but I agree, they can be pricey. David, Texas seems to be a state or gardening extremes...but I guess that's to be expected with a state that big! Megan, you guys need to plan a trip to Oregon! ks, that is serious talk! Resorting to $3 buck chuck? (or is it still just $2 in California?). Karen, oh now don't go getting carried away...orange is here to stay. I'd say turq is just a current flirtation. myimaginarygarden, I'm going to start using ppa (pairings, placement and arrangement) as a garden term...I think it could catch on! Nice work. gorgeous garden! 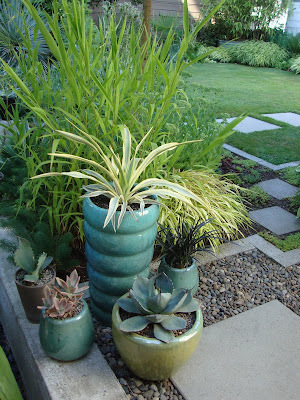 I love the horsetail, the planters and even (especially) the green mailboxes. What a great garden. Glad you photographed it.